The authorities in Basra will not co-operate with British troops until they get an apology for a raid to free two UK soldiers, its governor has said. Mohammed al-Waili has also demanded compensation for damage caused by the raid on Monday and a "guarantee that it does not happen again". Britain has defended its action, saying the soldiers were handed to militiamen by rogue elements in the police. British troops have reduced their presence on the Iraqi city's streets. For the second consecutive day British forces were not seen accompanying Iraqi police on patrols around the city, as they routinely had in the past. And elsewhere, a roadside bomb hit a U.S. convoy in southern Baghdad, killing one soldier and wounding six. Suspected insurgents shot at least eight Iraqis in four separate attacks on Thursday, according to officials. Authorities in the southern Iraqi city say troops killed two Iraqi police during Monday's raid. Iraqi Prime Minister Ibrahim Jaafari and Defence Secretary John Reid that the unrest has not strained relations between the two countries. 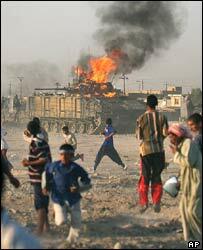 UK soldiers have described the moment when they were forced to flee their burning armoured vehicle during Monday's unrest. 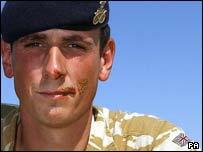 Sgt George Long, of the Staffordshire Regiment, said part of his face was on fire when he fled the Warrior vehicle. Mr al-Waili said: "The governing council met... and decided to stop all co-operation with the British until they meet three demands." Listing his wishes, he said: "To apologise for what happened, to guarantee that it does not happen again, and third, to provide some compensation for all the damage they did during the operation." He has also demanded compensation for the families of those whom the Iraqis claim were killed during the Army operation. The city council also wants the two British soldiers who were rescued to be handed back to the Iraqi police for interrogation. Stewart Innes, an official with Britain's consulate in Basra, told Reuters: "We will enter negotiations with the [governing council] in order to reach a solution to our problems," he told reporters." The Army said the two soldiers were taken by militants after the police ignored an order from the interior ministry to release them, but Interior Minister Baqir Solagh Jabr has denied this. During the ensuing political fall-out, the Iraqi prime minister has met John Reid in London to discuss the tensions surrounding the Army's rescue operation. Anti-British demonstrations continued in the city on Wednesday, according to BBC correspondents. But Mr Jaafari moved to quell disagreements by saying the incident was still being investigated. The Iraqi prime minister said there was still a "desperate need" for coalition troops while the Iraqis built their own security forces. But he added he was "optimistic" that Iraqi forces were making progress and shortening the amount of time foreign soldiers would be needed. Meanwhile, Pte Burton, 20, described to Channel 4 News the moment his vehicle came under attack from the mob, during which a petrol bomb was thrown into the turret. "It had seeped down in the back with the troops in the back, and down into the driver tunnel, located between the turret and the driving hatch," he said. Pte Burton said he had to kick open the hatch before jumping through the flames to escape.